Everyone can use a little help from time to time. If you had access to a team of experts, what area of your life would you seek to improve? 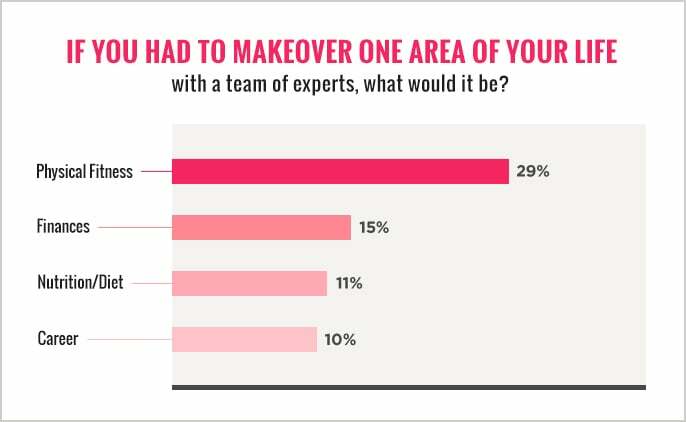 To help answer that question, as part of the POPSUGAR Insights 2014 Healthy Living Report, we asked women to pick the one area of their lives that they’d choose to make over with the help of a team of experts. Overall, 29% of women said that they’d makeover their physical fitness regimen. This was especially true of younger women between the ages of 18 and 24, perhaps showing that establishing a routine, finding creative ways to balance exercise with career, relationships, and other life challenges are important to women of this age group. Having an expert help to make over their finances ranked second (15%) among women, and in our interviews, women cited the importance of setting goals, especially financial goals, to help achieve balanced lives. This was especially true of women between the ages of 35 and 40. Women frequently cited financial planning experts like Suzy Orman as those they’d be interested in seeking advice from. Nutrition ranked third overall (11%), followed by career (10%), love life (7%), and home organization and design (7%). It’s clear that physical fitness and financial planning are highly important topics to women between the ages of 18 and 40, and marketers can take advantage of this by tapping into these interests and creating authentic connections with the use of experts or influencers to help women achieve their personal goals and succeed.